This weekend I started assembling the furniture for my Anet A8. Made from LACK IKEA tables. There’s nothing extraordinary here. The idea did not come from me, I saw many tutorials on the net, so I followed the movement. 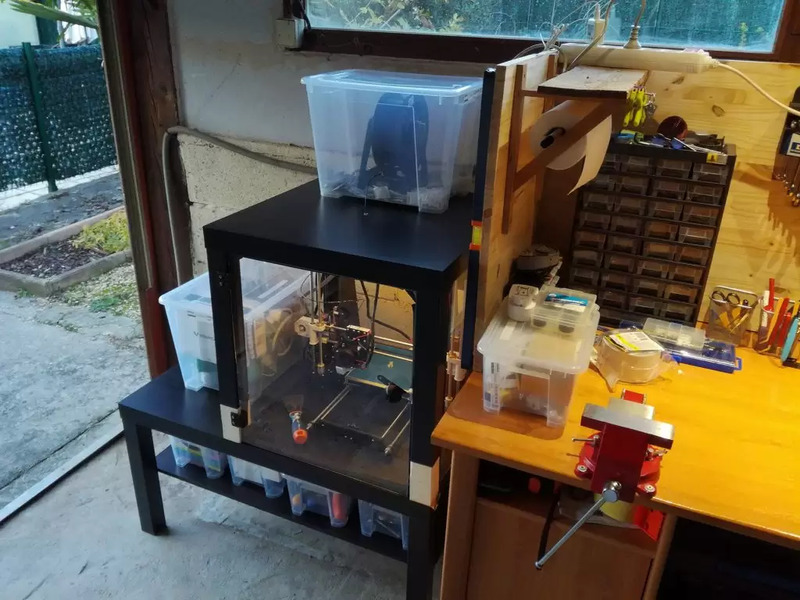 I am actually part of this tuto on thingiverse where all the pieces have to be printed before I can assemble the furniture. 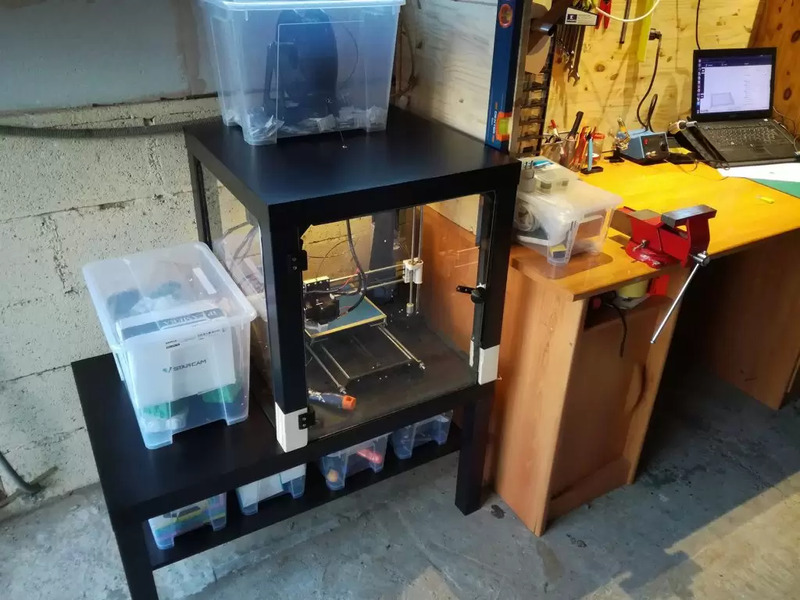 Except that at the time of printing the legs of the furniture, I was confronted with my first warping problems (I print in the garage and it was cold). 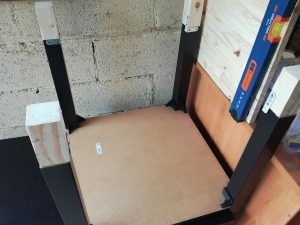 Not wanting to waste too much plastic and time (the impression of a foot takes 5 hours), I decided to use the fall of a cleat that I had which was 50 mm x 50 mm, that is to say the size of the legs of the table IKEA! Lucky:). So I replaced the plastic feet with wood, my furniture will have a little less class, but not serious. In fact, I had to make some adaptations. I also added light, some heat insulation (and soundproofing for the blow) and a switch. So I’ll explain all of this to you in detail. Before we start we already see what we need. You will need to get some materials. Then some tools are needed to assemble the assembly. Here’s what I used. If you don’t have it, replace it with a saw for wood and a metal saw for Plexiglas. 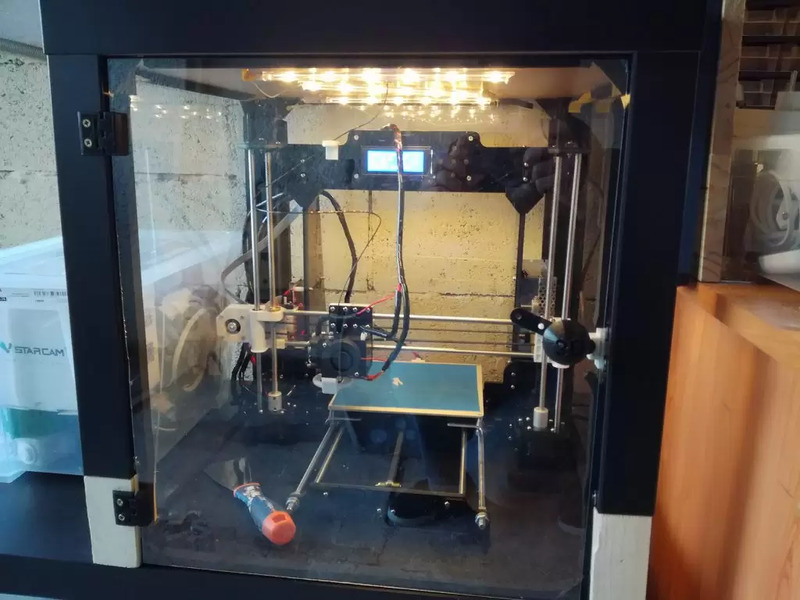 First of all, you will need to print the parts necessary for manufacturing the housing. 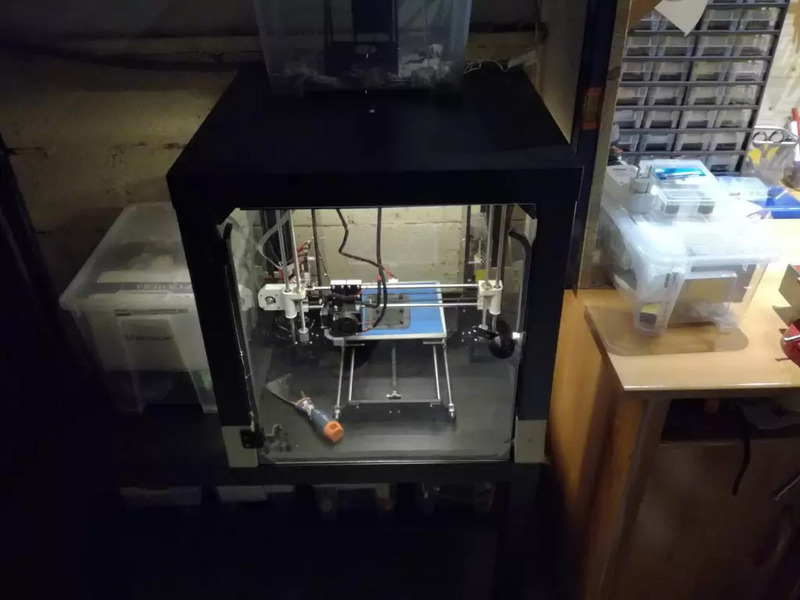 If you start with the Anet A8, follow the guide. 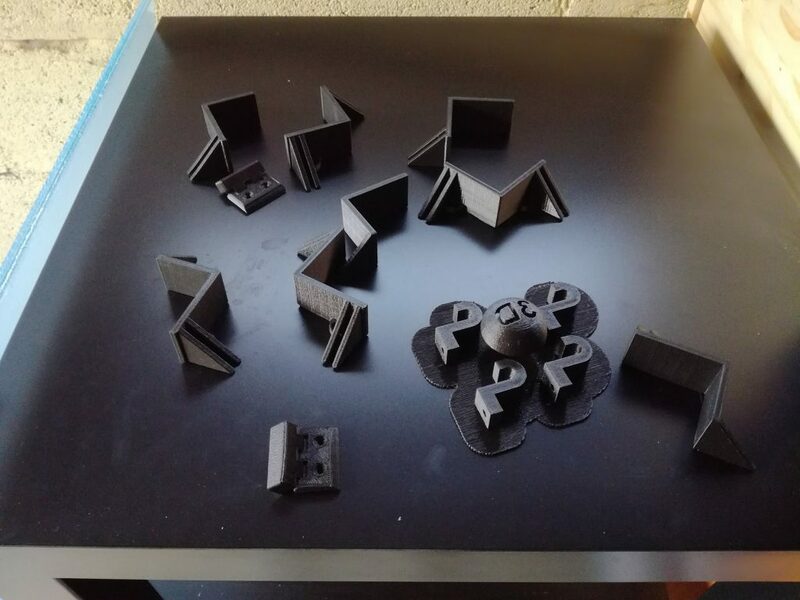 It takes about 16 to 18 hours to print all the parts and try to optimize as much as possible. Some of them I managed to print them in threes, saving me a little time. I remember I took liberties on the Thingiverse tutorial. I didn’t print the feet. So I didn’t have to print any other parts to replace the notches on feet (the place where the Plexiglas plates are blocked). Plastic feet are 10 cm high. So I cut my cleavage into 10 cm pieces. I filed a little the feet to make the whole set cleaner and make up for the imperfections of cuts. Turn the table over and screw in the legs using the angled angle brackets. Screw the supports onto the future “ceiling” of the case. Make sure that the simple cleats (Top_right_front_link. stl and Top_left_front_link. stl) are on the same side. The other three sides must have notches on each side where our windows will be inserted. The space between the two tables will be 50 cm high. The space between two feet and 45cm. On the other hand, it is necessary to count the space between two notches which is it of 43,5cm. For the door since there is no notch and leaving a little space so that the door “does not catch” it can be cut to 44cm. To summarize we will cut three plates in 50 x 43,5 cm and one for the door in 50 x 44cm. /!\ Be careful when cutting, the plexi is rather brittle. I had some cracks on the edge of the door. 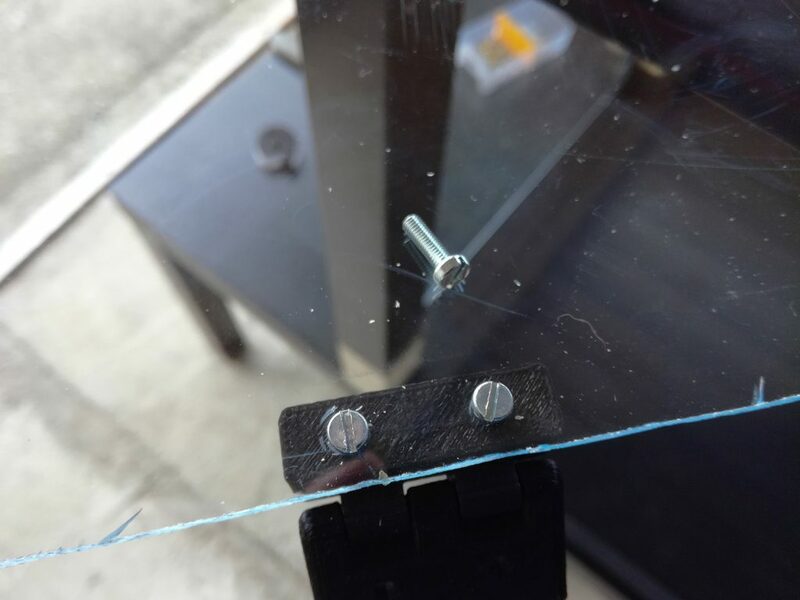 Step 5: Place the glass brackets on the bottom table. Turn the table over and screw the future glass supports to the base of each leg. Again, make sure that the simple cleats are on the same side. This is certainly the stage where I had the most trouble. I put foam gaskets on each side of the feet where there is a glass notch. Everywhere, except the front door. The foam starts from the top of the bottom notch and joins the top notch to leave as little space as possible. Once the foam was glued, I took a knife to cut a trench in the middle of it (to pass the glass through it). see photo. The glass must then be lowered between the two foams to the notches (this is where it is a little long). Foam and notches hold the glass in place so that it does not move. 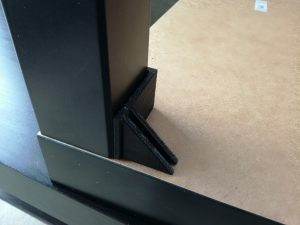 This makes it easy to turn the table over and insert feet and glass into their brackets without any screws. Repeat for the other two panes. Then I put down the IKEA LED stick. 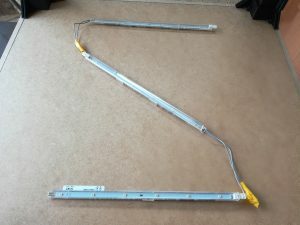 I did a bit of tinkering so as not to make a wand, but several strips of LEDs connected by wires. I just soldered a little bit together. 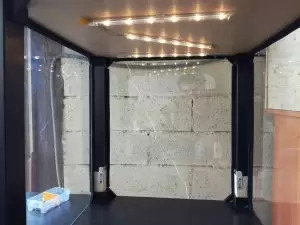 Avoid this do-it-yourself by buying flexible LED strips. Or choose another lighting system. That is just one example. I passed the power cable through the rear window by lifting the rear window. The cable is very thin so there are no problems. 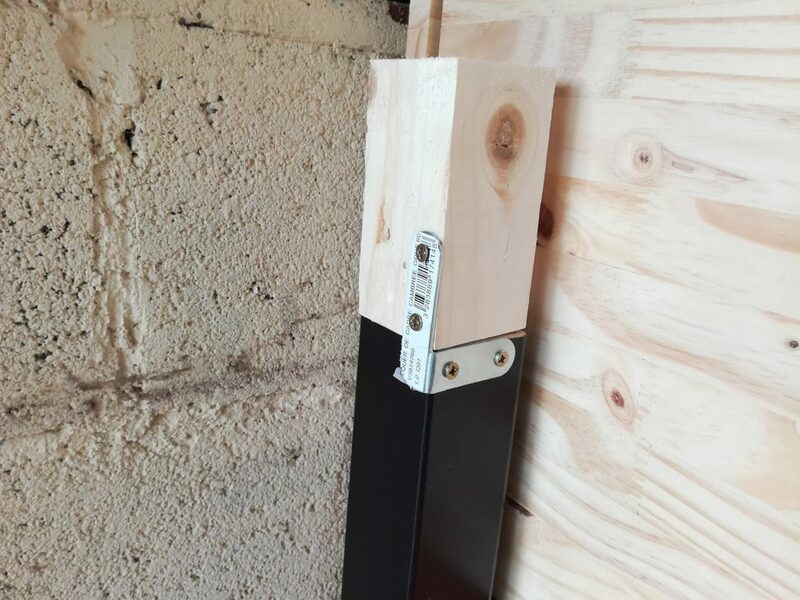 For installation there are small clips to be screwed on. Then we put our LED bars on top. Turn the table over and insert the glass / feet into the notches. In principle no problems and personally I did not add any screws to hold the lower part. The whole set is stable and this way I don’t have to remove any screws if I want to remove the top table to work on the printer. There is nothing to prevent you from inserting screws if you wish. 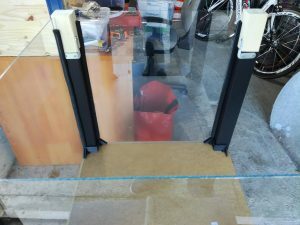 Then take the glass from your door and make 3mm holes in it to install your hinges and handle. We just have to aim the door on the furniture. Finish caulking the furniture by placing foam along the door and other glass panes. 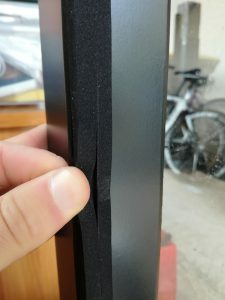 In the middle of the top tray, make a hole to pass the plastic filament through. My filament is stored in a 22L IKEA plastic box. I made a hole there to pass the filament through. I also filled the box with silica gel sachet to absorb moisture. Here too, this is just one example of how you can adapt to suit your needs. Before putting the printer on, I made a small hole by filing the bottom of the glass. I have filed enough files to run the printer’s power cable through. I cut the cable to keep only 30 cm of it. I then put the printer in the cabinet (there, pass it over) and put the cable through the hole. So I stripped the wire, put some terminals to connect it to the switch. Then I installed the switch on one of the legs of the bottom table. By making this box for my 3D printer, I’ve already made a lot of progress in upgrading my Anet A8. For the rest I will add MOSFETs to secure the supply and make the heating bed and extruder heat up faster. I would also like to put the autolevel on the printer so that I don’t have to adjust the tray height. And the last planned modification, I would like to set up an octoprint print server that would run on an orange pi. I will keep you informed of all these changes:). In the meantime, have fun and good craftsmanship. Feel free to share your impressions by leaving a small comment.